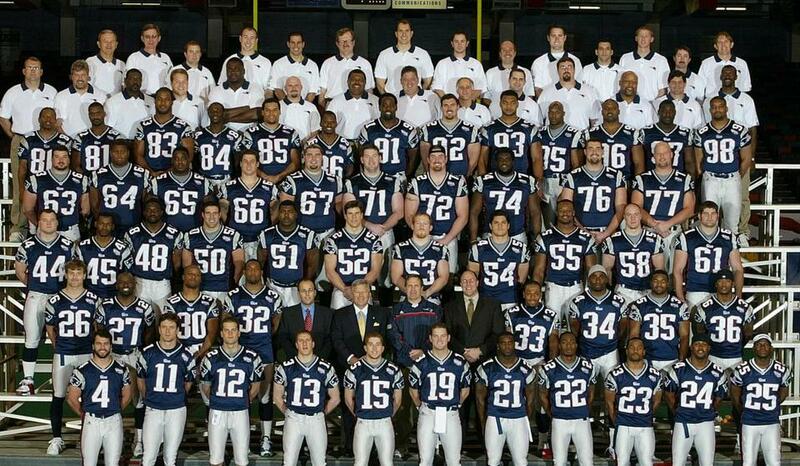 A team photo of the Super Bowl XXXVI Champion New England Patriots. Troy Brown (80) WR: Joined Comcast SportsNet New England as an analyst following his retirement in 2008. David Patten (86) WR: Minister with the True Believers Church of Our Lord Jesus Christ in Columbia, S.C.
Jermaine Wiggins (85) TE: On-air personality with 98.5 The Sports Hub (can be heard weekly on the “Felger and Mazz’’ show). Also started his own clothing line called Wiggy Wear 85. Marc Edwards (44) FB: Junior partner/product manager at Speedshield Fleet Solutions in Jacksonville, a company founded two years ago that specializes in forklift safety. Antowain Smith (32) RB: Lives in Houston and works as a sportscaster for onlineradio1.com. Tom Brady (12) QB: Still with team. Matt Light (72) OL: Still with team. Mike Compton (77) OL: Offensive line coach at Bluefield College in Virginia. Damien Woody (65) OL: Analyst for ESPN. Joe Andruzzi (63) OL: After successful treatment for non-Hodgkin’s Burkitt’s lymphoma, he founded the Joe Andruzzi Foundation in 2008 to provide financial assistance for cancer patients and their families. Greg Robinson-Randall (64) OL: Works at the Devereux Center in Houston, helping mentor juvenile delinquents. Bobby Hamilton (91) DE: Coach at Maynard Jackson High School in Atlanta. Anthony Pleasant (98) DE: Defensive line coach for Kansas City Chiefs. Brandon Mitchell (96) DT: Arrested with his girlfriend on drug charges in 2008 after a two-year investigation by the Vermilion Parish (La.) Municipal Narcotics Task Force. Richard Seymour (93) DT: Playing for Oakland Raiders. Mike Vrabel (50) OLB: Linebackers coach at Ohio State and founder of the Second and Seven Foundation in 1999 with Ohio State teammates Ryan Miller and Luke Fickell to promote literacy. Tedy Bruschi (54) ILB: Analyst for ESPN. Roman Phifer (95) OLB: Produced the 2009 documentary “Blood Equity,’’ which focused on the struggles of life after football. Ty Law (24) CB: Analyst for Comcast SportsNet New England. Otis Smith (45) CB: Entering his third season as defensive quality control coach for Kansas City Chiefs. Lawyer Milloy (36) SS: Lives in Seattle with his wife and three daughters (with a fourth child expected any day) and is involved with several charities, including SeeYourImpact.org (helps people in Third World countries) and the Verizon Wellness Room (helps women from abusive homes). Tebucky Jones (27) FS: Resides in Farmington, Conn., and is head coach at his former high school in New Britain. Adam Vinatieri (4) K: After collecting two more Super Bowl titles with the Patriots, he moved on to Indianapolis, where he still plays, and won another title. Ken Walter (13) P: Resides in Huntersville, N.C.
Drew Bledsoe (11) QB: Lives in Bend, Ore., with his wife and four children. Co-founded Doubleback Winery in 2007 and was inducted into the Patriots Hall of Fame in September. Terrell Buckley (27) CB: Cornerbacks coach at the University of Akron. Matt Chatham (58) OLB: Opened SkyCrepers, a crepe restaurant, in North Attleborough last summer. Also works as an analyst for NESN and is a regular contributor to “Patriots This Week’’ on Comcast SportsNet New England. Je’Rod Cherry (30) FS: Co-hosts two shows on WKNR-FM sports talk radio in Cleveland. Fred Coleman (84) WR: Played arena football from 2004-08 and is now a physical education teacher in McKinney, Texas. Bryan Cox (51) ILB: Pass rush coach for Miami Dolphins. Kevin Faulk (33) RB: Still with team. Antwan Harris (23) FS: Lives in Raleigh, N.C., where he opened a Cajun restaurant called Zydeco Downtown. Larry Izzo (53) OLB: Assistant special teams coach for New York Giants. Charles Johnson (81) WR: Trainer at the Carolina Skills Academy in Raleigh and wide receivers coach at Wakefield High School, also in Raleigh. Willie McGinest (55) DE: CEO of “55 Entertainment,’’ which does event planning, charitable endeavors, and music production. Also owns a chain of restaurants in Southern California. Riddick Parker (97) DE: Founder and director of STARRS and Partners in Progress, nonprofit organizations that provide residential service for young men in foster care and leadership training for students in Baltimore. Patrick Pass (35) FB: Lives in Providence and is a certified personal trainer. Lonie Paxton (66) LS: Has played for Denver Broncos since leaving the Patriots after the 2008 season. J.R. Redmond (21) RB: Owns an Internet-based company called Just Run Pro Training (justruntraining.com) out of Carson City, La., that offers combine training as well as SAT/ACT prep courses. Grey Ruegamer (67) C/G: Works in student development office at Arizona State, his alma mater, mentoring athletes. Rod Rutledge (83) TE: Resides in Birmingham, Ala.
Terrance Shaw (22) CB: Financial adviser with Merrill Lynch, focusing on athletes. Matt Stevens (26) DB: Broke his spinal cord in a 2007 motorcycle accident, which has left him paralyzed. Grant Williams (76) OL:St. Louis Cardinals team chaplain, specializing in helping players make the transition to life after football.